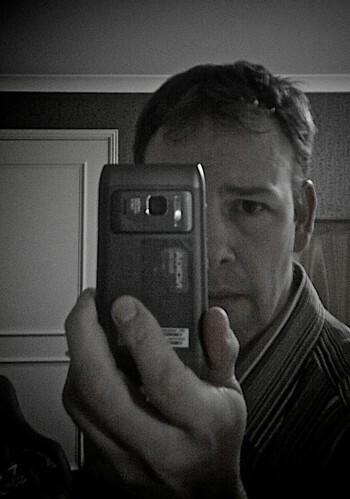 likeminds – Self Portrait – Nokia n8 style!, a photo by Benjamin Ellis on Flickr. Bit of a tech tragedy at the weekend – and a bit of an embarrassing one. My trusty Nokia n8 was sitting on my desk, peacefully minding it’s own business, when a 25Kg studio monitor fell off of the wall and landed on it. To the n8’s credit, there wasn’t a scratch on it, and it seemed to still be working fine… But when I switched it on the next day, it was clear that the screen had taken the brunt of the non-accoustic ballistic attack! 2) Great Twitter client – Gravity is still the most powerful twitter client I’ve used. Easy to upload photos (see point 8), and manage lists and following across the dozen or so Twitter accounts I help to look after. 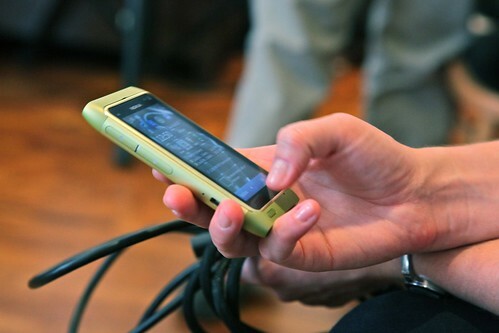 3) Skype – great over wifi, Skype keeps me in touch when I’m on the road. And it integrates wonderfully. 4) FM transmitter – hop in the car and listen to my tunes, without battling with wires. Benjamin FM ;). 5) Battery life – my experience with Android and iOS handsets has consisted mainly of desperately hopping from one power socket to another from 4 hours into the day. With the n8 I go on trips overseas and don’t even need to take a power lead. Win! 6) USB master socket – plugging in a memory stick or a USB keyboard is much more straight forward than pairing bluetooth keyboards and ejecting memory cards. It’s a surprisingly neat feature. 7) HDMI output – yes, I know lots of handsets have this now, but the n8 was my first experience of quite how useful this is – even in the business world, were I seem to be doing most presentations via an HDMI equipped large screen these days. So there you go. I’m missing the n8 :(. What next? I’m not sure. I had a bit of a soft spot for the lemonade green n8 I saw at the launch. The e7 looks like an interesting variation (I have a bit of a fetish for built in keyboards – like the n900). And, of course, the n9 has been announced… Tough choices!